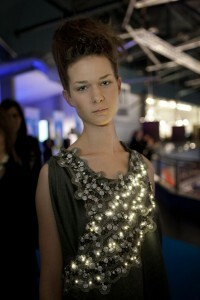 It is a beautiful pollution sensing dress. The most fascinating function of the dress is that the CO2 dress monitors the CO2 levels in a given environment and visualizes the data in real time with a flickering of light patterns. Carbon Dioxide (CO2) is a colorless, and the carbon dioxide itself can cause headache, dizziness, nausea and other symptoms at high levels. It is very clever that people can realize the level of carbon dioxide through the dress in the space – slow pulsations when the levels are low, short and hectic when they’re high. The CO2 dress is functional and aesthetic. I would love to buy this dress for the environment! 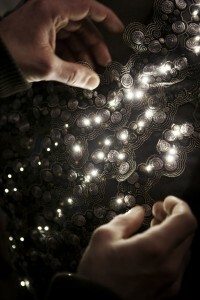 The dress is constructed using soft circuit techniques including the Lilypad Arduino, and the LEDs are stitched into the embroidery of the dress. This entry was posted in Week 1: Course Intro, Workshops on September 7, 2015 by haj278.